Camp CenterStage provides campers and staff an opportunity to explore what they love (various forms of the arts) all while participating in character-building experiences! A day at CCS is equal to 3 days anywhere else. 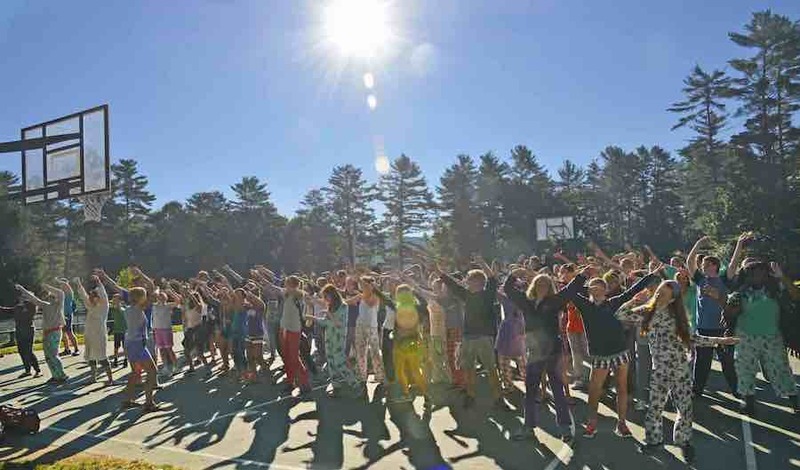 Campers attend daily studios of their choice and rotate through singing, dancing and workshops sessions which allow them to explore a variety of arts based as well as traditional camping experiences. Campers share in community living by sharing a cabin with other campers, a CIT (counselor in training) and counselor. Our days are filled with opportunities to learn life-long skills, hone crafts, explore new experiences and support each other! Building community is what we do best here at CCS. Our campers extend the skills gained at camp well beyond their Maple Lane experience. Campers are encouraged to set daily and camp-long goals and meet with their mentors on a daily basis to set out steps to accomplish these goals. 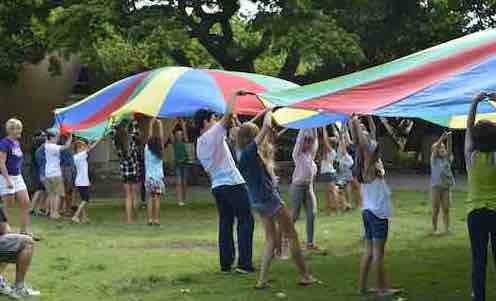 Every day campers have the opportunity to swim, sing, dance, make friends, hike, act, play games and make new friends. Visit our Parents Page for much more information! In keeping with our philosophy of "Achieving excellence through the arts", Camp CenterStage will provide campers an experience which will nurture their talents and provide them with ways to use those talents for the betterment of themselves and their community. To that end, CCS will provide Community Enrichment opportunities by hosting off-campus trips to various organizations where CCS's campers will share their talents and skills with the community. Camp CenterStage (CCS) is proud of our open, supportive and inclusive environment for campers and staff. CCS believes that all youngsters with a desire to attend summer camp should be provided the opportunity. CCS is welcoming of all campers is and open to all campers. One of our core values is to provide a welcoming, nurturing and supportive environment for all campers who have a desire to use their artistic skills to enrich our community and our lives. We make every effort and work with all parents to provide a comfortable place for all campers. We regularly adapt our program to fit the needs of all campers, and believe in fully integrating all campers into our cabin groups, teams and mentor groups. We provide for specialized diets, whether for reasons of allergy, religious, or lifestyle choice (vegetarian / vegan). We can provide private changing spaces for campers. We offer multiple workshop electives every day and campers have many choices regarding their learning and camping experiences. We include all campers in our Mentor program which provides roundtable discussions. We strive to have a diverse staff team, and include diversity training as a core element each summer. If you have any questions or concerns about your child fitting in at camp, or the camp's ability to provide for your child's specific needs, please contact the camp Leadership Team (visit our Contact Page) - we support your camper's success! Cabins are ever camper’s “home away from home” – a place where they can enjoying living with past and new friends and develop their social skills in a community living situation. We generally place campers in cabins in two-year age grouping so that they live with similar stages of development. Each cabin sleeps 10 people: 1 counselor, 1 CIT (Counselor in Training) and up to 8 campers. Campers are encouraged to bring trunks for easy organizing of clothes. Each cabin has shelving units around the perimeter of the cabin and includes 4 electrical outlets and a ceiling fan. Check out our recommended Packing List on our Parent page. Cabins are responsible for daily clean-up and bunk inspection takes place every afternoon, with the winning cabin eating dinner at “the island” in Nelson Hall. Cabins are on a rotating schedule for: wayside (lavatory) cleaning, breakfast set-up / clean-up and lunch set-up. Because our scheduling process is individualized to campers, the daily schedule is not by cabin. Cabins do attend breakfast and dinner together and are also on the same color team. All cabins are named for world famous theatres. Cabins are part of a larger unit: Color Teams. Teams are co-ed and are purposely made up of different age groups. Competition is a part of our every day lives. Learning to cope with, and handle competition, is important. Competitive team activities are a part of a well-balanced camp experience. CCS Color Team competitions build inner strength and create community sharing. At CCS, an emphasis is place on developing an appreciation of the task at hand and sportsmanship, not winning for winning’s sake. Mentor Groups are made up of 8 – 10 random campers within a 2 – 3 year age span. Our "Mentor Meeting" component is designed to help campers reflect on the experiences of camp and to create goals for their camp experience, as well as set goals to bring back to their school and community. Mentor Meetings facilitate dialogue between campers and mentor regarding campers' development as artists, campers, leaders and peers. These meetings create quality time for conversation, sharing and communication. Mentor groups will be developed based on interest, age, experience and goals. The purpose of Mentor Meetings is to share passions, reveal frustrations, set goals and share accomplishments. Campers are most likely to form close friendships in their mentor groups which will stand the tests of time! Studio groups meet every day, providing the opportunity for accumulated learning and rehearsing or building to a final product. Masterclasses are studio sessions for campers with previous experience. These both are an opportunity for all campers to strengthen specific skills while nurturing their creative and artistic abilities. Studios and Masterclasses include: Theater Dance, Musical Theatre, Filmmaking, Acting, Creative Writing, Exploring Art, Team CCS, A ’Capella, Improvisation, Rock Band and Leadership Skills (not all studios are offered every session).